For students, “sweet victories” are not so sweet anymore. Earlier this year, the Howard County Public School System made changes to the nutritional guidelines that sparked a wildfire of conversation. This system includes limiting the lunch meal portion size, putting healthier food choices in the vending machines and prohibiting after-school bake sales or classroom parties with food. “Howard County children will greatly benefit as a result of these new wellness standards,” said Nicolette Highsmith Vernick, President and CEO of the Horizon Foundation, to Howard County Unsweetened. While Howard County believes that the new policy is a way to build better, healthier students, some argue it is not beneficial for schools a large. The new “healthy food” really may not bring anyone the taste of success after all. For years, students have grown accustomed to donuts and pizza as a class reward. Taking away incentives seems counterproductive in promoting active students. During Mt. Hebron’s Canned Food Drive, for example, the class with the most dedicated philanthropists has received a pizza party or candy. Now the Student Government Association (SGA) will have to find other options.Furthermore, when it comes to school lunches, if the students do not like the food being served in the school cafeteria, they will not eat it. Whether it’s a small child or a high schooler in the lunch line, this will never change. Some students buy the school lunches with a salad or some sort of fruit or vegetable and end up throwing it out without even touching it. Rather than teaching them to eat healthy, they may just be throwing out Howard County’s persistent suggestions. 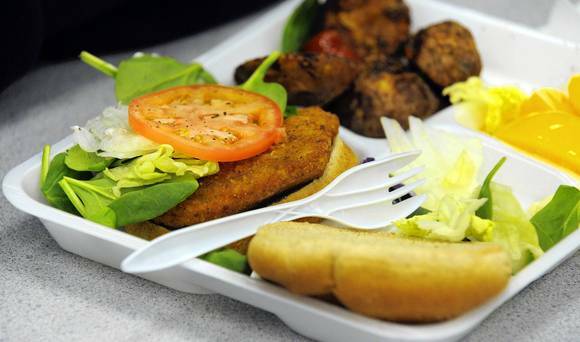 Current school lunches try to balance different food groups and provide “nutrient-dense” food items, according to the policy (Photo courtesy of The Baltimore Sun). The last few years, having bake sales for a class has been a major way to fund clubs or projects throughout the school. Now, bake sales are a nostalgic topic of the past. “I don’t like that you can’t have a bake sale. I used to buy things. It’s a shame,” commented Assistant Principal Dr. William Neugebauer. Students are not the only ones who think that it is not a good way to kick off the school year. “The new food tastes like sawdust and cardboard,” Dr. Neugebauer laughed. Students also miss the types of food that were stocked in the vending machines last year. “I used to buy a soda every day after school. Now I don’t,” said Junior Joey Petti. Students who stay after school for clubs or sports get thirsty and hungry, and if the sodas and snack foods that they got every day last year are no longer there, it could make them frustrated. Water and a protein bar are a better fit for long, hard practices, so the County is not wrong, but tradition is a hard nut to crack. Even though students and faculty might not know the ins and outs of the new policy, the effects of it have impacted many of those who buy (or used to buy) the school lunches and snacks.